Now in its 19th year, the Central YMCA’s Back On Track program has been helping youth adjudicated to Level II probation. While in Back On Track, participants attend education sessions to understand the nature of their offense, recognize the impact it has on the community, and learn skills to prevent reoccurrence. Last year, Back On Track joined forces with the Delaware Children’s Department and its Civil Citation program which provides a civil alternative to the formal arrest and criminal prosecution of youth under 18 who commit certain low-level misdemeanor offenses. By partnering with the Civil Citation program, we are able to provide early intervention as another tool for law enforcement to move low-level first time juvenile offenders through the system efficiently and effectively. In the Fall, Governor John Carney signed House Bill 442. House Bill 442 expands the Juvenile Civil Citation program to provide law enforcement officers with the discretion to refer any first-time juvenile offender engaged in any misdemeanor-level behavior to the Civil Citation program. A juvenile who successfully completes the requirements of the Civil Citation program will not have an arrest or prosecution indicated on their record. 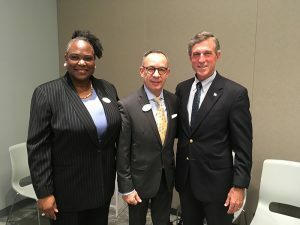 At a recent Bill Signing Ceremony with Governor John Carney are Brenda Overton, Program Director for Back On Track at the Central YMCA, and Jesus De Las Salas, Senior Executive Director for Central and Walnut Street YMCAs.